Not only the Tories likely to have serious differences but Labour too. Jezza has been an ardent hater of the EU all his career until he pretended to want to remain in it to appease the new young mass membership. Momentum seem to be targeting about 50 MPs that are anti Jezza but those same people are wanting to stay in the Single Market and Customs Union, confusing times. 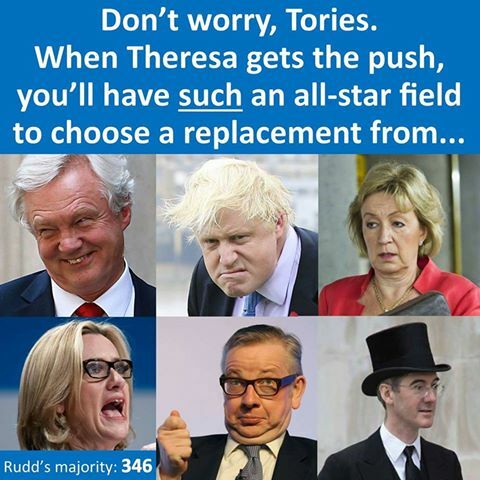 Theresa May is only in power in order to be the fall guy after the Brexit deal inevitably goes belly up. Very noble of her, but completely untenable. The problem with that Neil is that politics has been going downhill, as the state of the tory party as you see it will do little to engage people. Here's a thought, why not the Honourable Member for the 19th Century? would be like digging up William pitt the younger to be prime minister. Well, he gets my vote, even if it's just to annoy the trendy liberal lefties at the Guardian! I couldn't work out why the bloke was getting so worked up. a cartoon character is hardly likely to become Prime Minister.of the United Kingdom. Hang on a minute scrub that. I thought I'd get the link to an apt Independent article in before Mr McSweeney1 does! Checked with the bookies who have David Davis at 3/1 joint second favourites at 6/1 are Phil Hammond and try not to laugh, Jacob Rees-Mogg. Which one will Michael Gove back then back-stab? If only the member for Rushcliffe was 25 years younger and a Brexiteer! Spoilt for choice aren't we? no,no,no you all wrong,its William pitt the younger,they dug him up and atos passed him fit for work.all the above mentioned are not fit for purpose. limp dems are a waste of space.